Lauded in Gramphone for his “abundant energy, powerful fingers, big sound, and natural musicality” and praised by the San Francisco Chronicle for his “Fervency and panache,” American pianist CHRISTOPHER ATZINGER is celebrated for insightful performances and a reputation for excellence. Christopher Atzinger has performed extensively throughout the United States and Europe, highlighted by appearances at Carnegie Hall (New York), Salle Cortot (Paris), St. Martin-in-the-Fields (London), National Concert Hall (Dublin), American Academy (Rome), Liszt Museum (Budapest), Barrocco Cultural Arts (Valletta), Smithsonian Gallery of American Art and The Phillips Collection (Washington, DC) and Dame Myra Hess Series (Chicago). Festival appearances include the Banff International Keyboard Festival, Brevard and Mendocino music festivals, Bridge Chamber Music Festival and the Chautauqua Institution. As guest soloist, Christopher Atzinger has appeared with the Louisiana Philharmonic Orchestra, North Carolina’s Brevard Repertory Orchestra and the symphony orchestras of Duluth Superior, Jackson (MI), McAllen (TX), Shreveport, Springfield (MA) and St. Olaf, under the batons of Steven Amundson, Peter Dabrowski, Dirk Meyer, Stephen Osmond, Kevin Rhodes, Mischa Santora, Klauspeter Seibel, Dennis Simons and Steven Smith. Christopher Atzinger’s live performances have aired on radio stations WFMT-Chicago, WJR-Detroit, WXEL-South Florida, KPAC-San Antonio, WUOL-Louisville and WGTE-Toledo, while his artistry has also been heard on WGBH-Boston, KING-Seattle and Kansas, Minnesota, New England, South Dakota and Wisconsin Public Radio, as well as on television stations in Chicago and Cincinnati. On CD, Christopher Atzinger has three highly praised albums released on MSR Classics - a debut solo recording of Bach, Beethoven, Barber and Fritze; an all-Brahms album; “American Lyricism” with scores by Richard Danielpour, Monica Houghton, Pierre Jalbert, Justin Merritt and Christopher Theofanidis. He has also recorded works of Judith Lang Zaimont for Naxos and music of Amy Beach for Centaur Records. A disc devoted to the music of John Knowles Paine will be released on the Delos label in the spring of 2019. Christopher Atzinger is a medalist of the Cincinnati, New Orleans, San Antonio, Shreveport and Seattle international piano competitions. He was also a winner of the National Federation of Music Clubs Artist Competition and the Simone Belsky Piano Competition, as well as the Premio Città di Ispica prize at the IBLA Grand Prize Competition in Italy. Additionally, he is the recipient of grants and fellowships from the Theodore Presser Foundation, Foundation La Gesse, American Composers Forum, Minnesota State Arts Board and Joyce Dutka Arts Foundation. He is also a 2012 recipient of a McKnight Fellowship for Performing Artists. 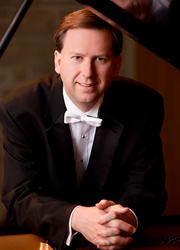 Christopher Atzinger holds degrees from the University of Texas at Austin and University of Michigan, and earned the Doctor of Musical Arts degree in piano performance from the Peabody Conservatory of Johns Hopkins University. Among his principal teachers he counts Julian Martin, Robert McDonald, Anton Nel, David Renner and Carolyn Lipp. Additional keyboard studies were undertaken with Timothy Lovelace, Edward Parmentier and Penelope Crawford. A dedicated teacher and coach, himself, Dr. Atzinger served on the faculty of Pennsylvania’s Dickinson College, prior to his current appointment at St. Olaf College in Minnesota. He has also lectured at The Juilliard School and Berklee College of Music and conducted masterclasses throughout the United States. Atzinger is blessed with abundant energy, powerful fingers, a big sound and natural musicality. He makes the best possible case for Gregory Fritze’s well made 1989 Sonata, moulding the jagged, proclamatory unison motifs and full-throated chords in contrary motion with immense authority, taking great care with the slow movement’s inside-the-piano strumming and plucking. Atzinger more than holds his own against the Barber Sonata’s finest recorded practitioners (Horowitz, Cliburn, Browning and Wild) and benefits from MSR’s warm, roomy and most attractive engineering. Atzinger proves himself to be a master of the fugue in his debut recital. Beginning with Bach, the original and supreme master of the fugue, then progressing through late Beethoven to arrive at the brilliant final movement of the Barber sonata, we are treated to a great overview of this form. There are no weak movements, only wonderful music-making. Christopher Atzinger is surely a pianist to keep a watch for. The Barber Sonata seems to be an Atzinger calling-card, with its high-flown, percussive lyricism. Atzinger bestows upon the opening Allegro energico the same taut, hard-edged patina we know from the Horowitz and Browning versions. The second movement Scherzo might be Barber’s equivalent of a Liszt etude, according to Atzinger’s playful fingers. The Adagio brings out Barber’s concession to ‘modernism’ and Schoenberg, but it retains a bluesy, American character. The fugal last movement has Atzinger in molten form, providing ardent, scintillating evidence of his technical and sympathetic commitment to this music. [Schubert’s Sonata in B-flat major] is beloved less for its technical arrangement than for the festive, gently hymn-like feeling it projects. This was brought across masterfully by Christopher Atzinger with an aesthetically rich performance. He unlocked the thematic richness of the first movement, gave the andante sostenuto an introverted, song-like treatment, and lent ‘delicacy’ to the scherzo. The rondo of the final movement was charged, stirring. The first is an uncommonly fine release. Late Brahms piano pieces are intricate, sometimes difficult works, so I like to follow them with a score. With the music in front of me I was doubly aware of the hundreds, no thousands of little rhythmic adjustments–agogic accents, rubato, and the like–that Atzinger brings to the music. He has fantastic control of rhythm in his shaping of phrases, and his ability to bring a hidden melody to the foreground is exemplary. All the pieces are paced very well, and the piano sound is excellent. Atzinger is a pianist to watch. The two large pieces on this disc [Zaimont Sonata; A Calendar Set], played with fervency and panache by pianist Christopher Atzinger, provide a glimpse of both her monumental vein and her more intimate voice - and both are compelling.